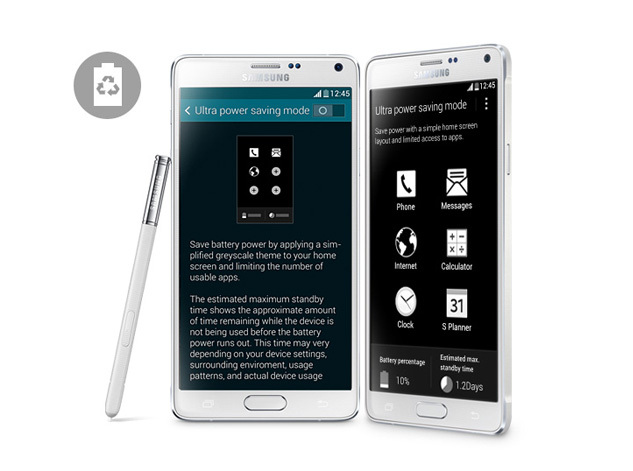 Samsung Galaxy Note 4 – one fantastic phablet? 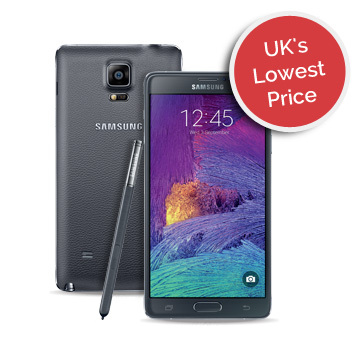 The Samsung Galaxy Note 4 is one of the most successful mobiles of recent years. With an improved S Pen, users can enjoy features such as Snap Note, which allows you to turn photos of text into editable documents. Throw in a Quad HD display, fingerprint sensor and great camera specs and the Galaxy Note 4 is a powerhouse of a phone! Bad news. We no longer range the Note 4. Don't worry, we have a huge range of Samsung phones at prices you'll love. How will the Galaxy Note 4 push the boundaries of the Note 3? This video delves into the features that have created the hype. Will we see the Youm Display on the Galaxy Note 4? We’ve seen the concept. How likely is it that Samsung will place this design into the upcoming Note 4? Read more. What exactly is the Samsung Gear VR? How do you use it? If you fancy finding out about the hardware which has got everyone so excited, you might want to stick around. Read more. Two great smartphone releases from Samsung, but how do they compare? Our latest compare guide explains it all. Read more. Featuring a soft-textured back cover and high-quality metal frame, the Samsung Galaxy Note 4 certainly looks stylish and feels premium to hold. All phablet fans want a sizeable screen which illuminates with detail and the Galaxy Note 4 makes sure it doesn’t disappoint. Arriving with a 5.7 inch Quad HD Super AMOLED display, you can enjoy high resolution with fantastic picture quality. Enhanced Multi Window lets you make the most of the large screen; multitask easily, access apps with split or pop up screens and change their size or position effortlessly. First announced on the Galaxy S5, expect to see fingerprint recognition tech on the Note 4. Useful for keeping access to your mobile restricted, the feature can also approve purchases via PayPal. 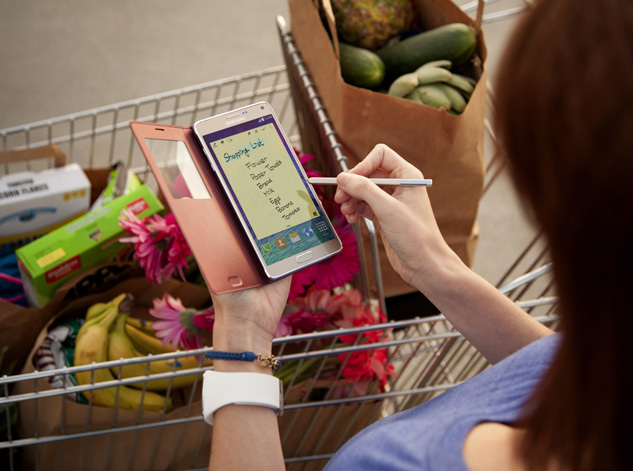 Improved and enhanced, the S Pen feels more like using a real pen than ever before. For students, there’s also a new functionality called Snap Note which allows you to take pictures of a classroom presentation and save it as an editable file. As expected, the Galaxy Note 4 also comes equipped with a powerful 16 megapixel camera with Smart OIS to stop blurry shots. 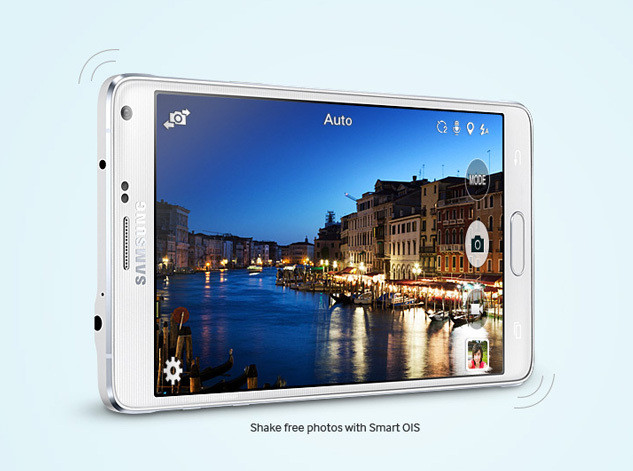 It also features a large selfie-taking 3.7 megapixel front-facing camera with wide-angle lens for great group shots. 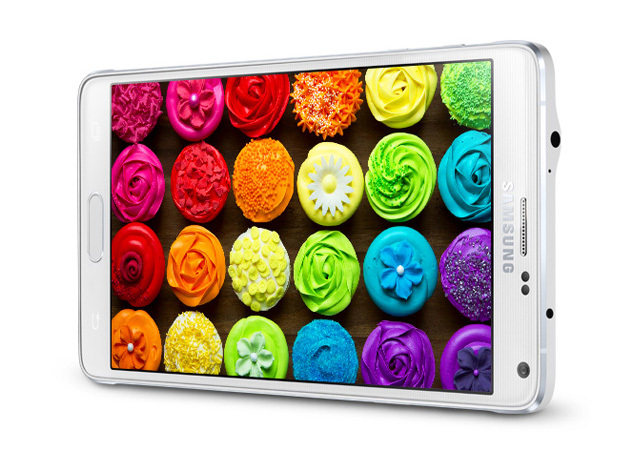 The Note 4 is one of the first smartphone releases to house a super-responsive Snapdragon 805 processor. As a quad core chip, the latest release from Qualcomm handles demanding tasks with ease. Whether its faster web browsing or loading multiple apps at the same time, the power of the 805 processor will ensure the Note 4 stays smooth and responsive when you need it most.